A very clever idea, this. 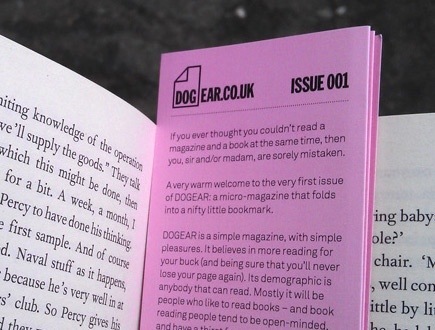 DOG EAR is a magazine in the form of a concertina bookmark, with ten slim pages of writing and illustration selected from online contributions. It’s available for free from independent bookshops and libraries (cunningly hidden between the pages of books to perk up surprised readers, I like to imagine). I love the way the content must fit the unusual dimensions of the magazine. Rather than being a restriction, it seems to inspire imaginative uses of space, containing drawings akin to comic book panels, and flash fiction. There’s also snippets of funny overheard comments and quote-worthy status updates, the latter making messages borne on the most transitory of mediums appear more like transcribed responses from interviewed authors, or the one-sentence reviews that adorn film and theatre posters, simply by harnessing the fleeting digital in print. DOG EAR reminds me of “reverse shoplifting”, where people plant copies of their books in shops or libraries – subversive D.I.Y distribution. I fancy the idea of self-publishing writers creating their own collections with bookleteer, then quietly slipping them into the bookshelves of esteemed literary establishments. Using any means to spread the word.